Despite the amount of time this blog implies I spend doing booze related activities I do also have a day job as a computer programmer. As part of this ‘secret’ second life I like to go and play at techy conferences and this last weekend I attended Barcamp London 8. Despite the potential of the word ‘Barcamp’ to refer to boozy activities (although there was a bar that I worked on and a lot of booze consumed, with drunken karaoke as the natural consequence of the latter) it is instead a free, community driven unconference, where there is no specific agenda and talks are all proposed and scheduled during the conference itself. 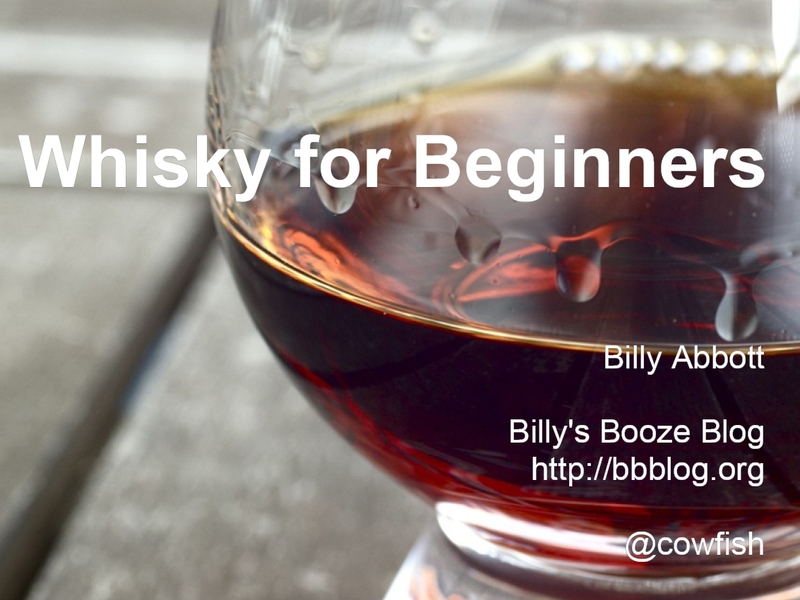 While Barcamps are traditionally quite technical in nature they are not prescriptively so and I ran a session on one of my favourite topics – Whisky for Beginners. Master of Malt Mo’land Movember whisky. Lowland blended malt Scotch whisky. 40% ABV. ~£35 from Master of Malt. SMWS 127.3, ‘Beach BBQ for Older Boy Scouts’. Islay (Port Charlotte) cask strength single cask single malt Scotch whisky. 67%. ~£50. Sold out at the SMWS site. The unmatured new make spirit was from the Glenglassaugh spirit drinks range – Clearac and Peated. Both 15% ABV and £13.25 for a 20cl bottle from The Whisky Exchange. Many thanks to all of those who came along. Please drop me a comment or email with any comments – it was my first Barcamp talk so any hints and tips are greatly appreciated. The talk has a page on lanyrd.com, so please add anything else you find about it up there. Although I may know about the making bits, the tasting bits I’m sadly lacking on. Thanks for an enjoyable talk! Now, when are we going drinking? Really regret missing your talk, I would have been there if it was not for the fact I was giving mine at the same time.